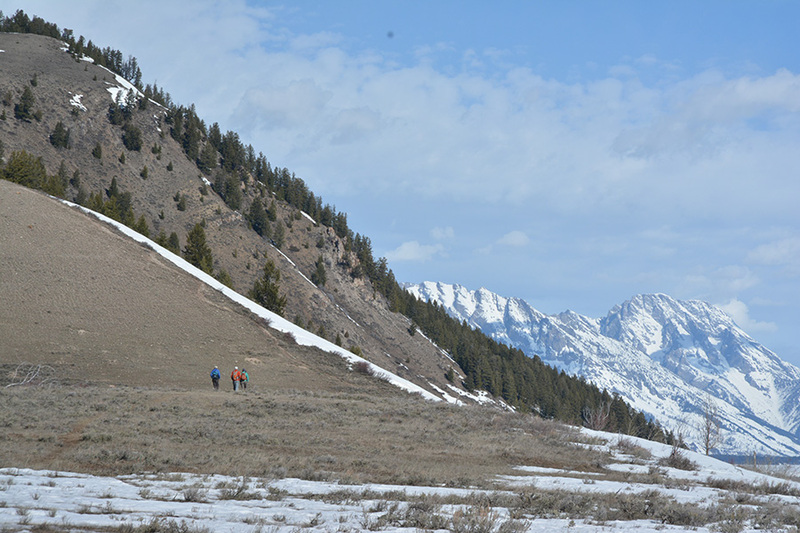 If you haven’t already been out scouting for early spring wildflowers, now it the time! 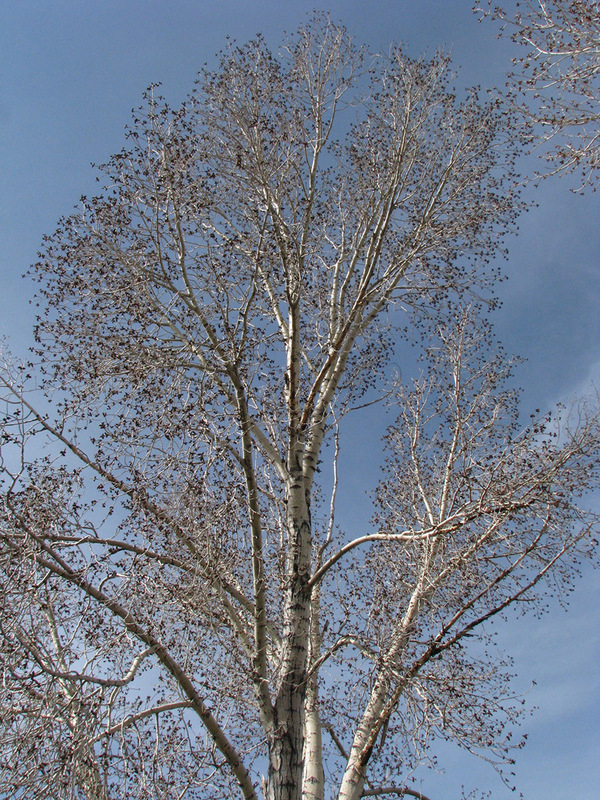 Cottonwoods (Populus spp.) are expanding their buds. 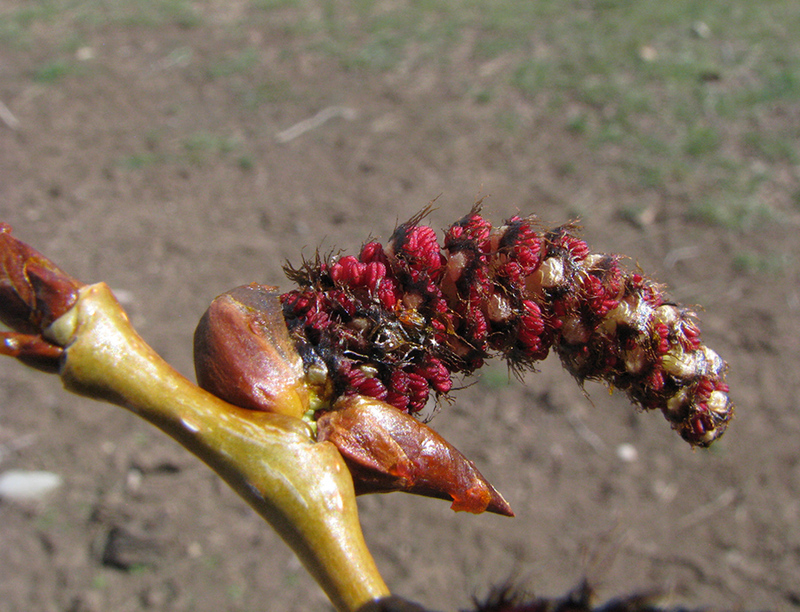 Buds of Cottonwood trees (several confusing species of Populus) are swelling and in some places the male catkins are ready to shed their pollen onto the winds. Look closely at the black frills on individual flower bracts. The anthers are maroon. Cottonwood male catkin is exploding out of its confining, resinous bud scales. Willows (Salix spp. ) 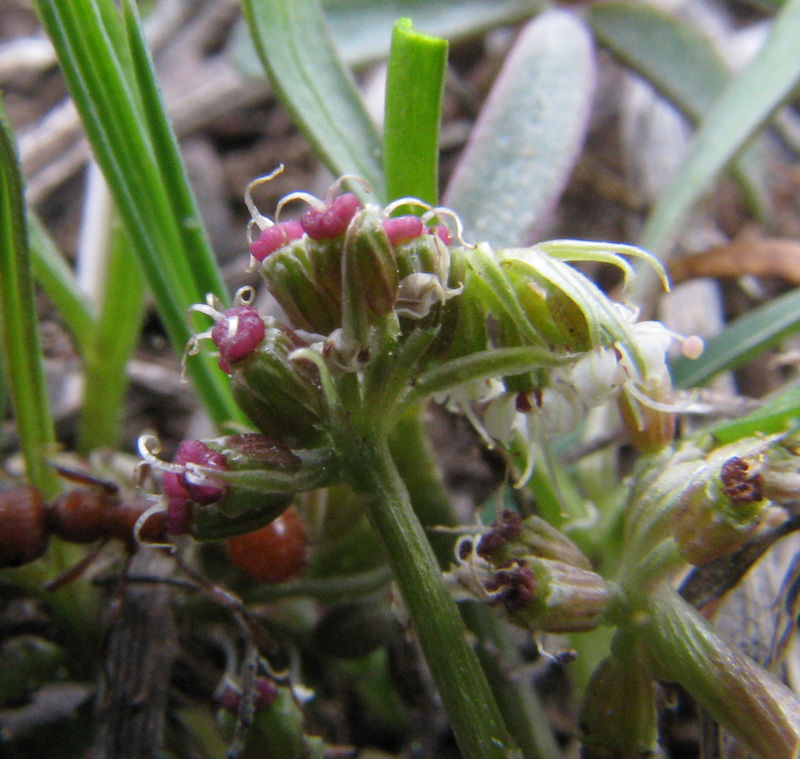 – “Pussies” are emerging from their single bud coverings. 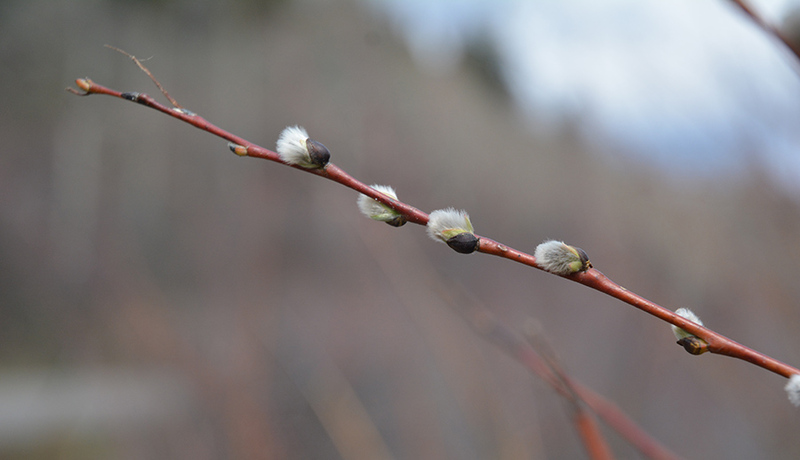 In the same family as Cottonwoods and Aspens, willows also produce male and female catkins usually on separate plants. Most flowers are wind pollinated. Willows (Salix spp) of many kinds are expanding their catkins (pussies) out of their single bud scale covering. Elegant! Turkey Pea or Orogenia (Orogenia linearifolia) is only an inch or two high and has minature umbels of flowers. 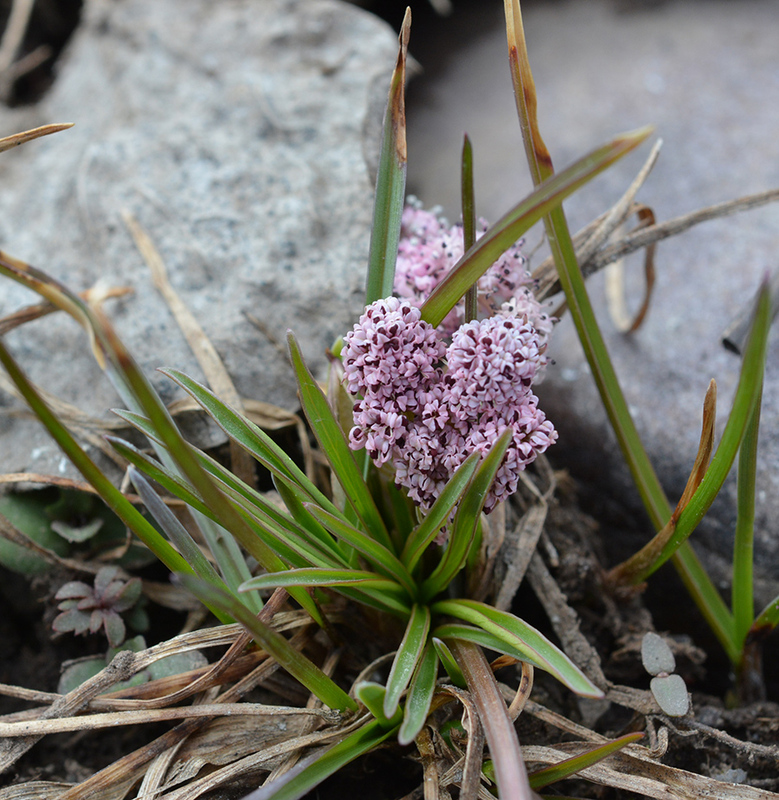 This is an unusual pink form found near the base of Munger Mountain. Turkey Pea or Orogenia (Orogenia linearifolia) – Dingy-white to rarely pink flower clusters are hard to find unless you are really looking. The individual flowers are smaller than ant feet! Take a close look at the deep purple stigmas. The leaves are divided into grass-like segments, further confounding the search. 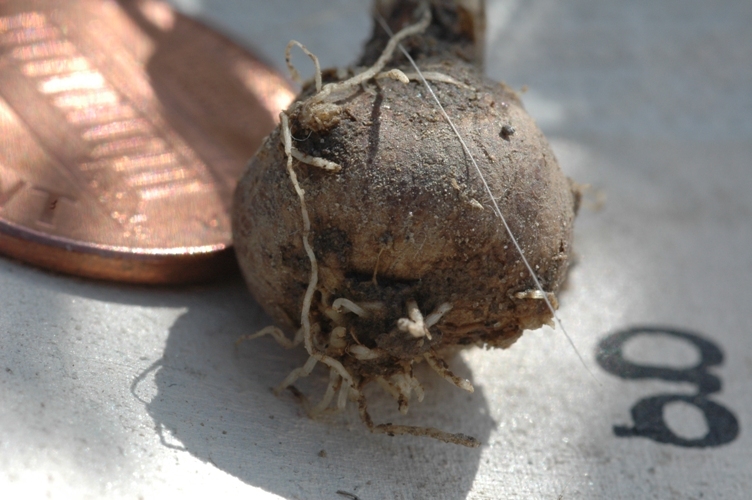 Turkey Pea has a bulb-like storage root. The “pea” part of the name comes from the underground bulbs relished by bears to sandhill cranes. Some were still blooming along Pacific Creek Road on April 26, but others were beginning to set fruit. The fruits of Turkey Pea or Orogenia are tiny, as are the flowers. Note the red “stylopodium” below the two white stigmas and above the smooth developing “schizocarp” – a dry fruit that will split in two. Steer’s-head (Dicentra uniflora) – The single flowers are smaller than a thumbnail and the whole plant with its dissected leaves is less than an inch high. Once you spot the flower, look carefully at its intriguing flowers so emblematic of the West! 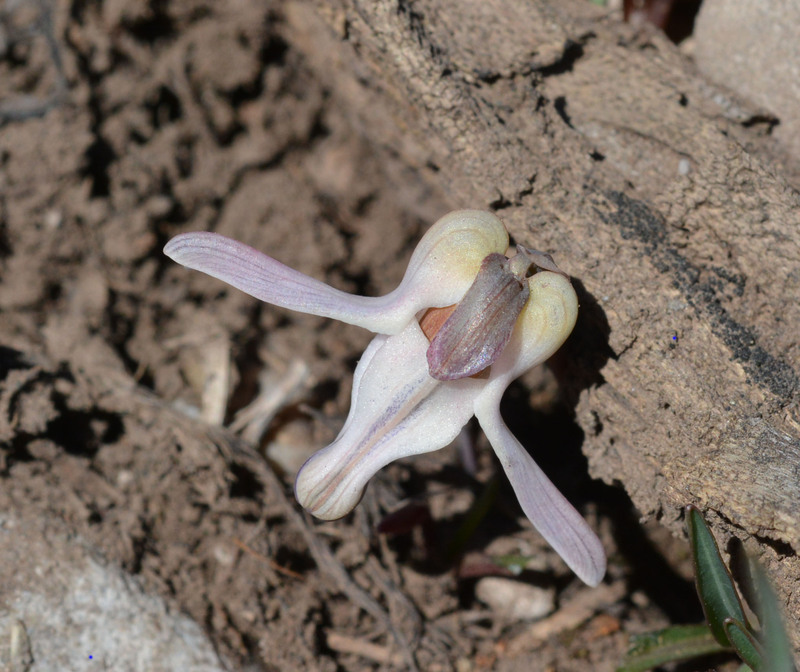 Steer’s-head (Dicentra uniflora) – is a quintessentially Western plant. Buttercups: The saucer-shaped yellow flowers gleam back at us from only an inch or two above the ground. The glossy yellow flowers are especially structured to provide this intense signal to pollinators: a smooth petal surface; yellow (carotenoid) pigments in the epidermal cell layer; a special air layer; and then another cell layer with white starch granules which reflect the light back at you (or the bee). Go to http://www.ncbi.nlm.nih.gov/pmc/articles/PMC3350741/ for the marvelous story. Sage Buttercup (Ranunculus glaberrimus var. ellipticus) grows in slightly drier habitats as the common name implies. The lower leaves and many of the stem leaves are elliptical (not lobed). 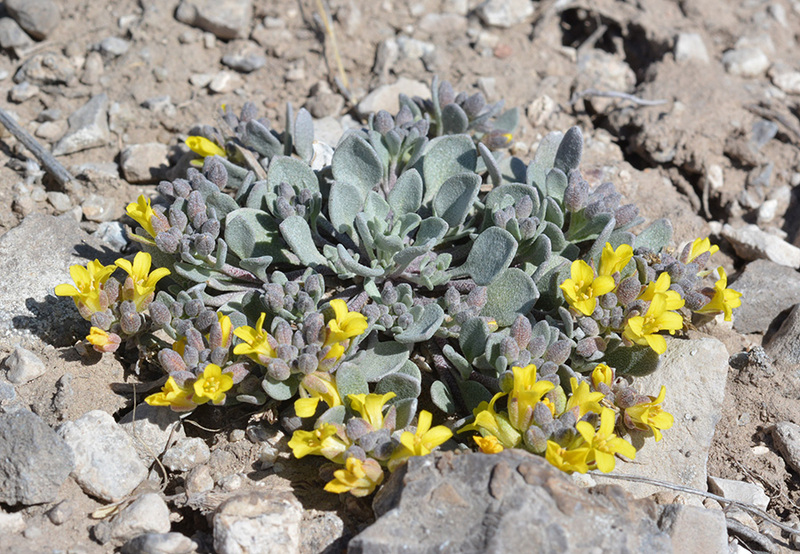 The petals are falling off in the southern end of the park around Antelope Flats, but go north and you will still find flowers shining in colonies between sage shrubs. 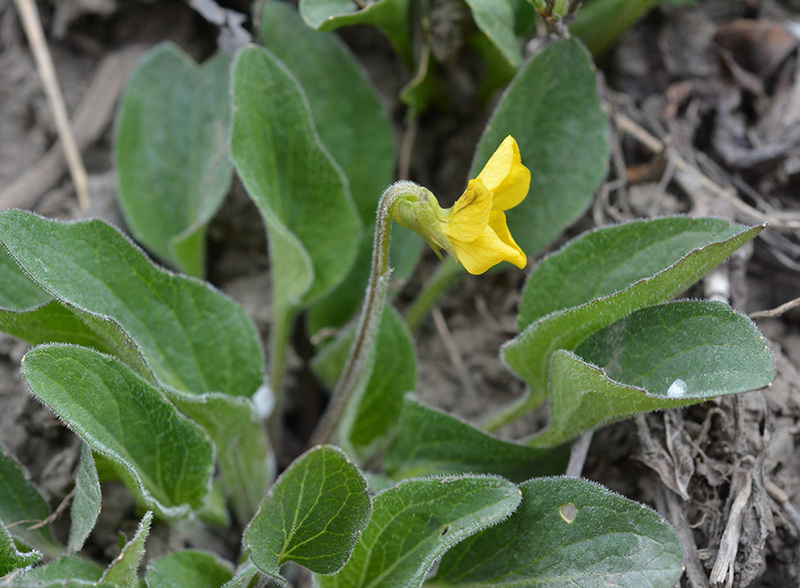 The lowest leaves of Sage Buttercup are not lobed. 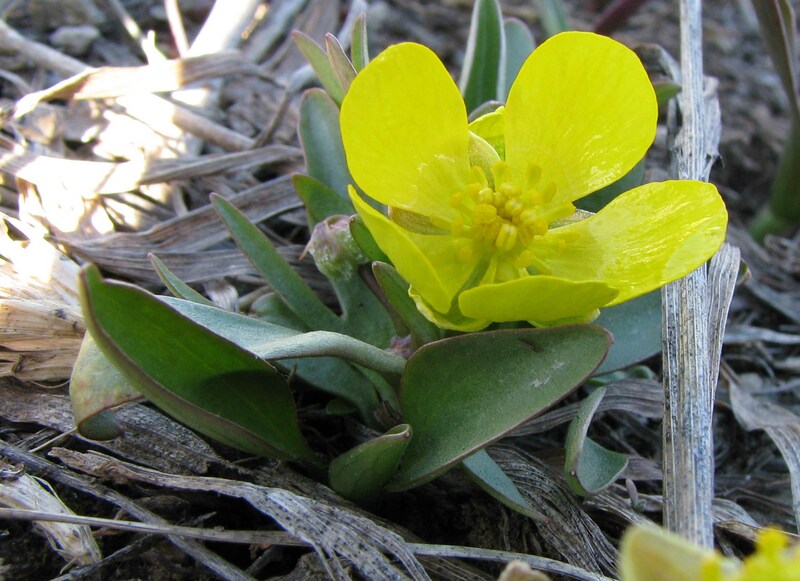 Utah Buttercup (Ranunculus jovis) – Typical of more moist sites, this species has three-(to five-) lobed basal leaves. And if you dig down (not in the park!) you would see that the roots are swollen. Carbs for wildlife. 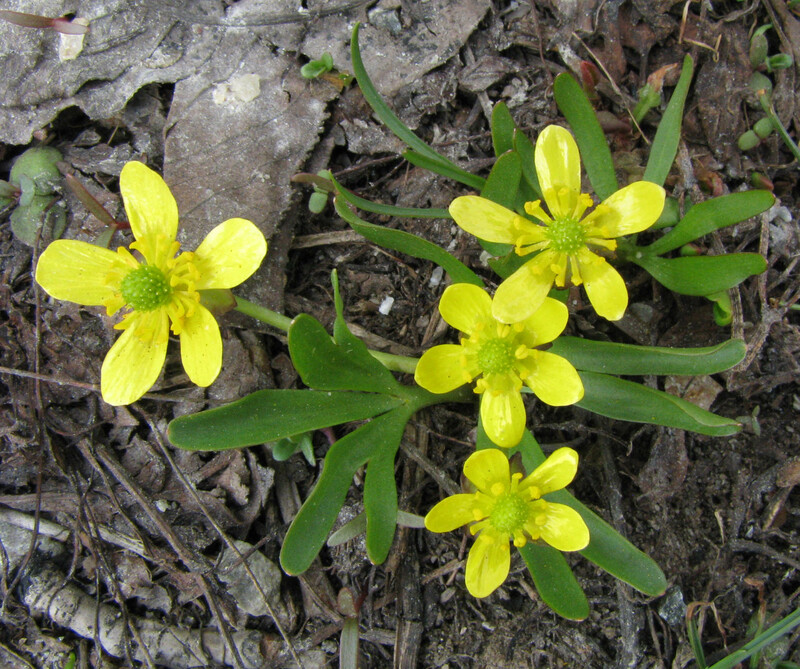 Utah Buttercup (Ranunculus jovis) sports lobed basal leaves and fattened roots. Spring Beauty (Claytonia lanceolata) – Delicate bouquets of white to blush flowers are true harbingers of spring around sage flats. Look closely at the deep pink nectar guides on the petals and find the nectar glands in the center which direct and reward pollinators. Yellowbells (Frittilaria pudica) – These dangling yellow, lily-like flowers are readily spotted along park roads: Moose-Wilson, Antelope Flats, and Pacific Creek. The 3-5” plants arise from bulbs just like lilies. 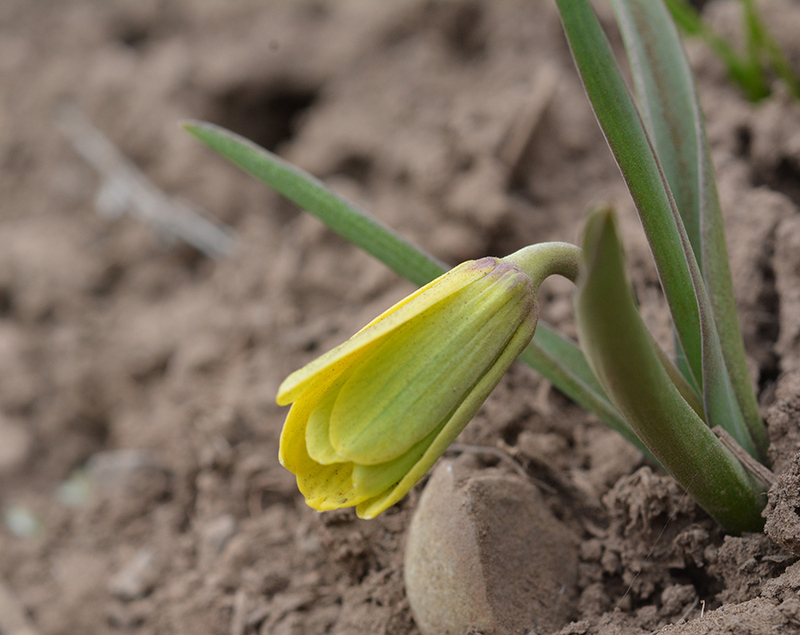 Yellowbells (Frittilaria pudica) are like miniature yellow lilies gracing sage flats and hillsides. Yellow Violets (Viola nuttallii var.) – Most of us can identify a violet by its unique bi-lateral flowers that guide insects into the nectaries hidden deep inside a spur formed behind the petals. The precise identification can be complex, but for the most part “yellow violet” will do for now. Yellow Violet (Viola nuttallii var) – has oval leaves and a spur that holds nectar to entice pollinators into the sexual parts of the flowers. Leaf shape and color on the back of the petals are some ID features used to determine species or variety. However these features are highly variable and confuse even experienced botanists. 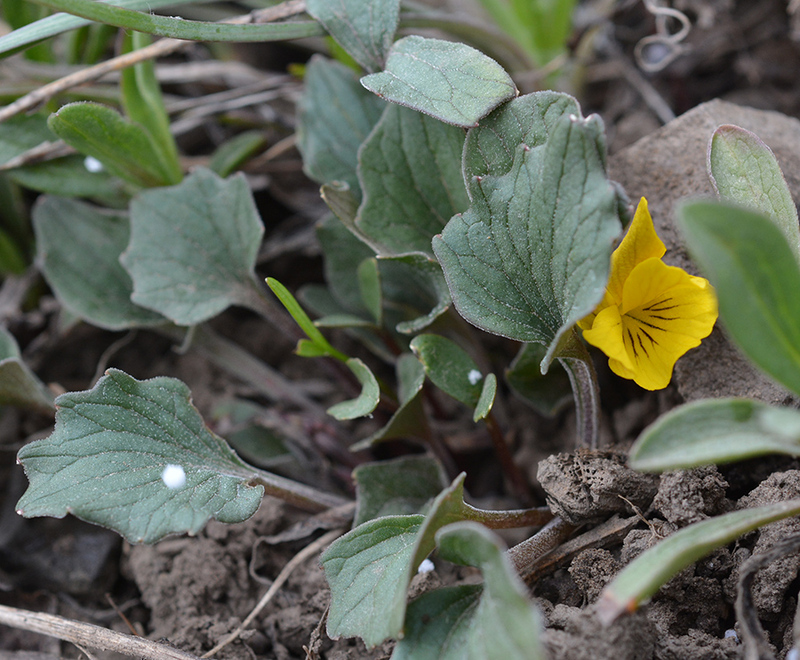 Another yellow violet, Viola purpurea – has leaves shaped like webbed duck feet. Here it is with spots of hail. This is easy to ID compared to other “yellow violets”. 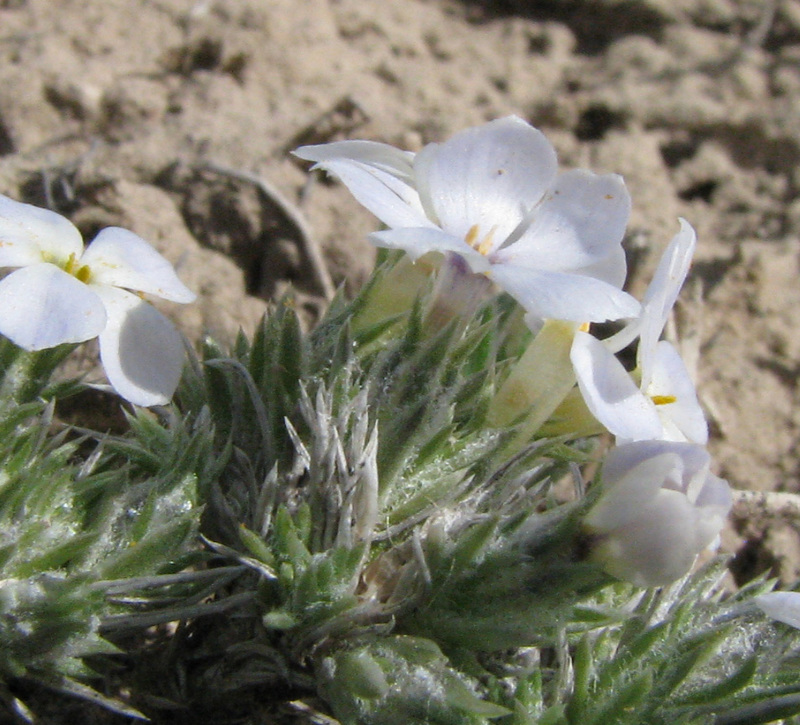 Some of the earliest flowering plants are found on south-facing, dry slopes. Common Twinpod (Physaria didymocarpa) – The four-petaled yellow flowers, which indicate its a member of the confusing Mustard family, are held just above a rosette of paddle-like silvery leaves. The fruits and starred hairs are used in positive identification. 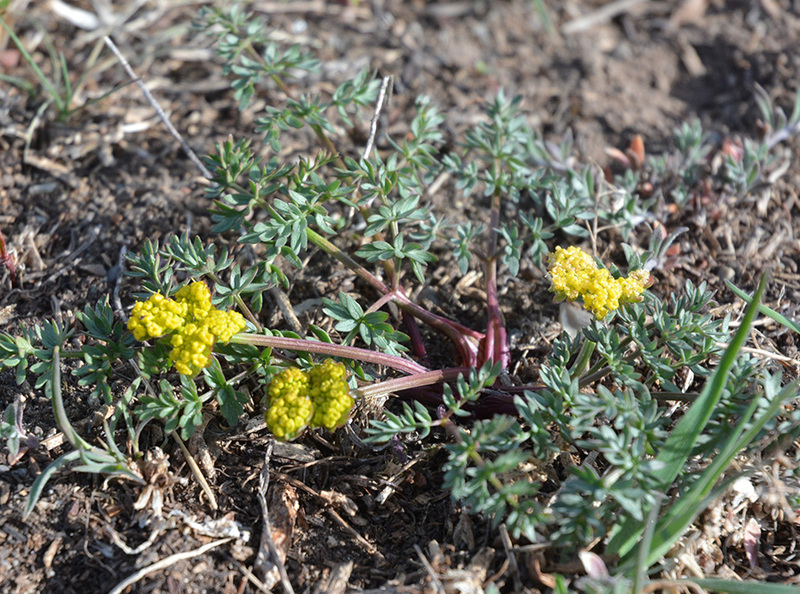 Twinpod (Physaria didymocarpa) grows on dry slopes of Blacktail Butte. 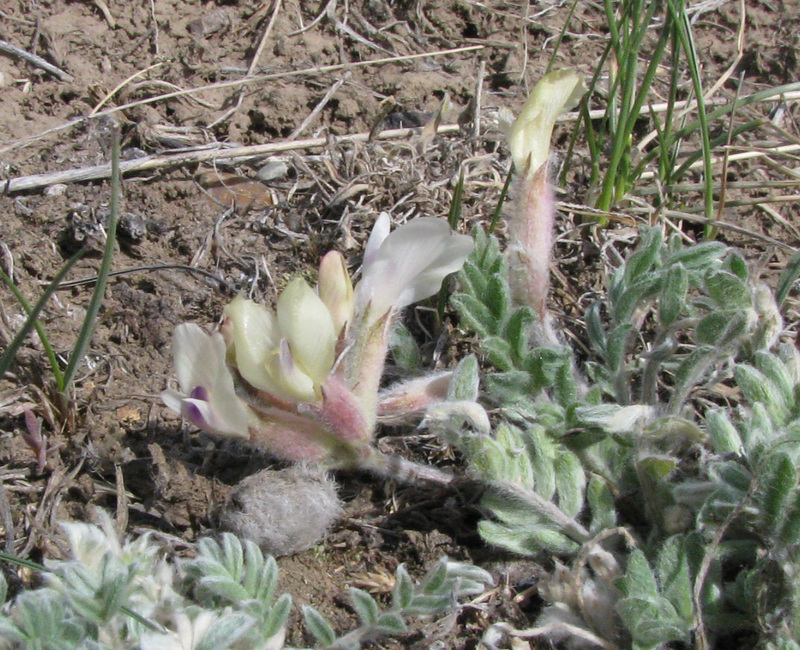 Pursh’s Milkvetch (Astragalus purshii) – The creamy to bluish pea-shaped flowers are held in clusters. The silvery leaves are pinnately compound e.g. are divided into segments like a feather. Later the fruits will become plump pea pods hairy all over. Pursh’s Milkvetch (Astragalus purshii) – has elegant pea-like flowers. Fruits will be furry, broad pea-pods. (Last year’s fruit lies just in front of the flower cluster). 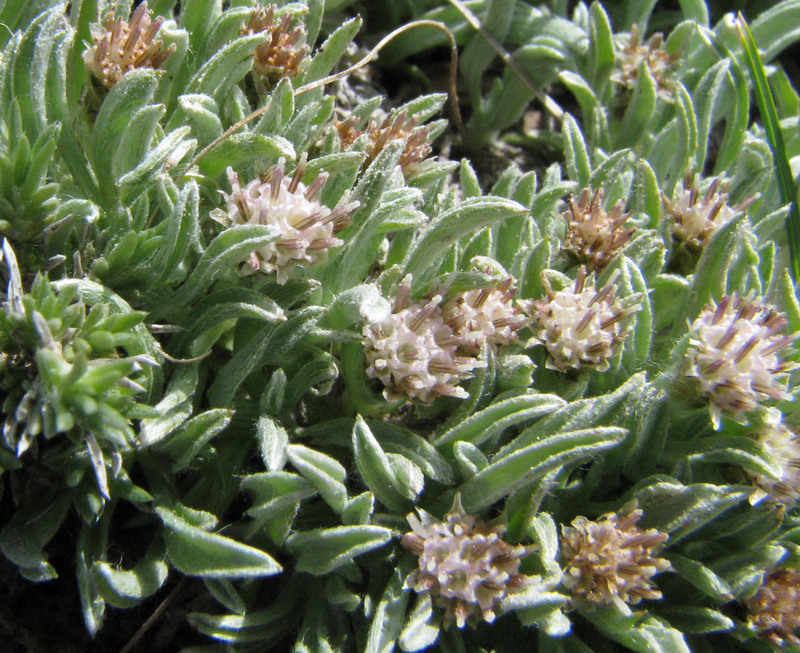 Less conspicuous are flowers of Low Pussytoes (Antennaria dimorpha). The 4-6” broad mats of tiny silvery leaves obscure the flower heads. As with most pussytoes, separate plants bare either female or male flowers. This is a female plant as seen by the stigmas pushing out in the center of the delicate goblet-like flowers. See if you can find plants with only pollen producing parts. 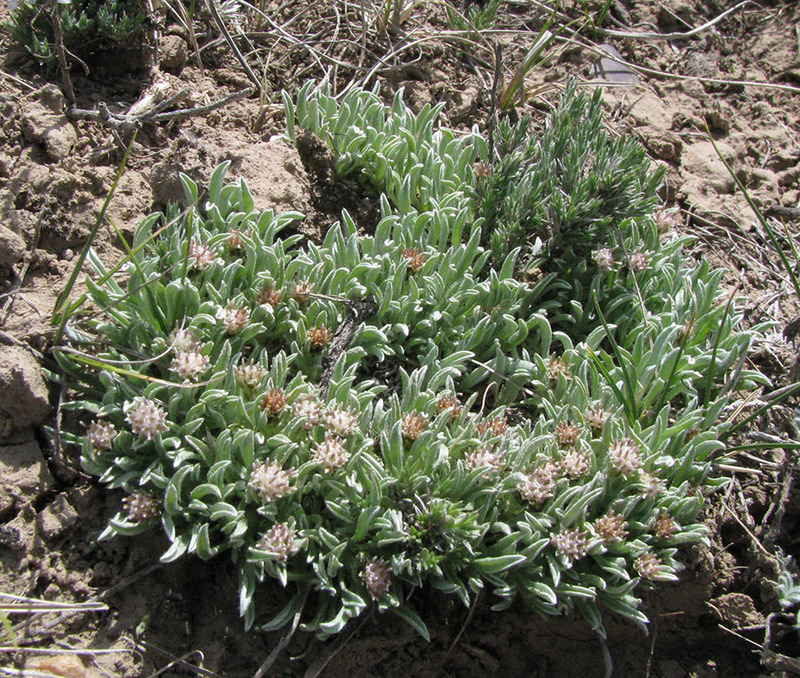 Low Pussytoes (Antennaria dimorpha) forms mats on dry slopes. In the Aster family, individual flowers are grouped into heads. These are female flowers. 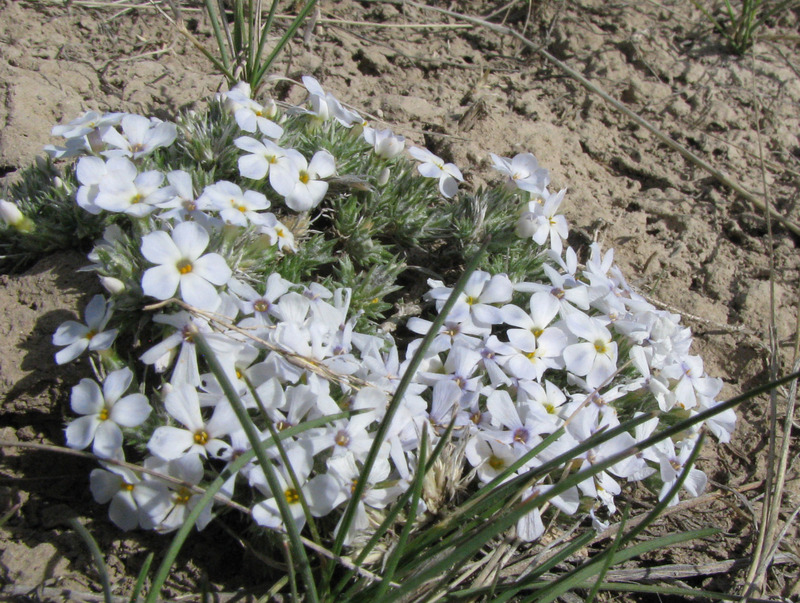 Hood’s Phlox (Phlox hoodii) – Like small patches of snow, these plants are scattered around Antelope Flats and elsewhere. The flowers are bright white, tubular, and very fragrant! Note the tiny pointed leaves have “cobwebby” hairs between them. Later in the season, another low phlox (P. multiflora) blooms with slightly larger flowers and no cobwebs. Hood’s Phlox (Phlox hoodii) is low growing and very fragrant! Hoods Phlox also has “cobwebby” hairs which help separate it from the slightly different Multiflora phlox. Why are so many leaves silvery hairy? In exposed locations, leaf hairs reflect sunlight and help shade leaves from too much intense sun. They prevent leaves from being sandblasted by soil particles. Finally, hairs hold in transpiring moisture to prevent desiccation. 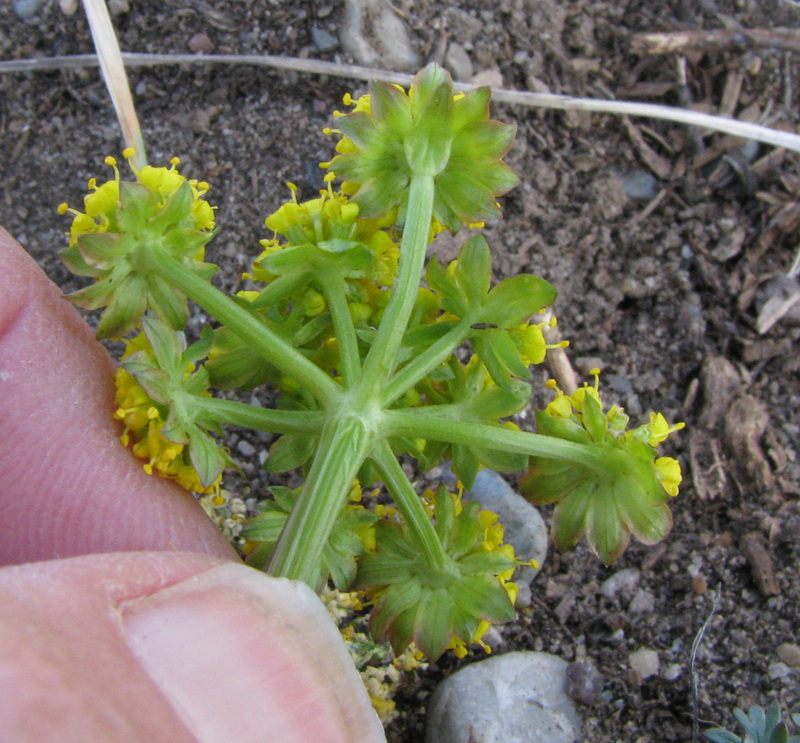 Cous Biscuit-root (Lomatium cous) – The delicately divided leaves, which look like sprawling parsley leaves, and the umbels (think ribs of an umbrella) of yellow flowers with broad bracts at the base are all good clues to identification. 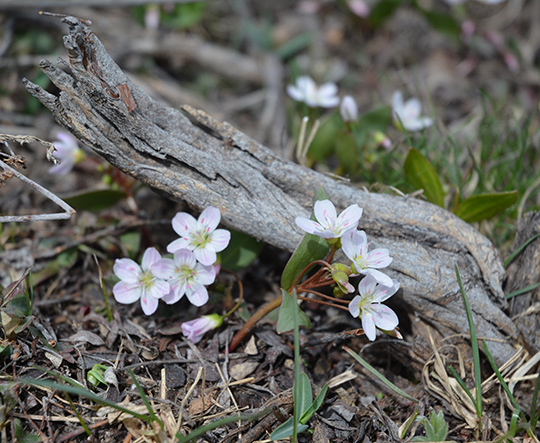 These plants are blooming along the Gros Ventre Road just east-southeast of the highway intersection. Cous Biscuit-root (Lomatium cous) is closely related to the plants that Lewis and Clark observed Native Americans using for food. The tuberous roots were ground and used for a bread. The broad bracts at the base of the flower, as well as the parsley-like leaves help in ID. If you haven’t signed up yet for our email list: tetonplants@gmail.org please do so. Then you will be alerted to more information, including our impromptu hikes!